When you sign up for my reader list, and confirm your address, I will send you a copy of the first chapter of “For the Love of Kari”. I will also send links to my free books. 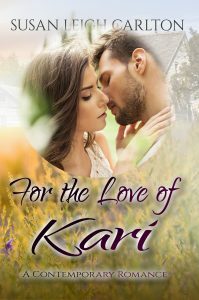 I am pleased to announce ‘For the Love of Kari’, a contemporary romance is now live on Amazon. At 228 pages, it is the longest book I’ve written in the past 3 years. A loner by nature due to a troubled youth, physicist Charles Vanlandingham struggles to express his feelings at the best of times. Combine this with a trip back in time that nearly costs him his life and left him reeling, he seems incapable of dealing with his feelings of love. A recent medical school graduate, Kari Berlucci, puts her career on hold for the once in a life time opportunity to work with MIT’s most renowned physicist. Despite the chemistry between the coworkers, Kari soon returns to her career as a surgeon when she discovers that her deep respect has turned to love, something that Charles seems unable to return. Will she be able to put him behind her and forget, or be left forever waiting for him to forsake the past and step into a future where they can be together? I have rated For the Love of Kari at two flames. There are scenes with sexual encounters but the bedroom door is kept firmly closed. Click here to purchase For the Love of Kari.